Climate scientists have predicted that ocean temperatures in the equatorial Pacific will rise significantly by the end of the century, wreaking havoc on coral reef ecosystems. But a new study shows that climate change could cause ocean currents to operate in a surprising way that mitigates the warming near some islands right on the equator. As a result these Pacific islands may become isolated refuges for corals and fish, according to the study by Woods Hole Oceanographic Institution scientists Kristopher Karnauskas and Anne Cohen, published April 29 in the journal Nature Climate Change. On color-enhanced satellite maps showing measurements of global ocean chlorophyll levels, these productive patches of ocean stand out as bright green or red spots. One of the most prominent occurs around the Galapagos Islands in the eastern Pacific. But heading westward from the Galapagos, chlorophyll levels fade like a comet tail, giving scientists little reason to look closely at scattered low-lying coral atolls farther west. The islands are easy to overlook because they are tiny, remote, and lie at the far left edge of standard global satellite maps that place continents in the center. Karnauskas, a climate scientist, was working with WHOI coral scientist Anne Cohen to explore how climate change would affect reefs in the central equatorial Pacific. To familiarize himself with conditions in the area, he examined chlorophyll maps. 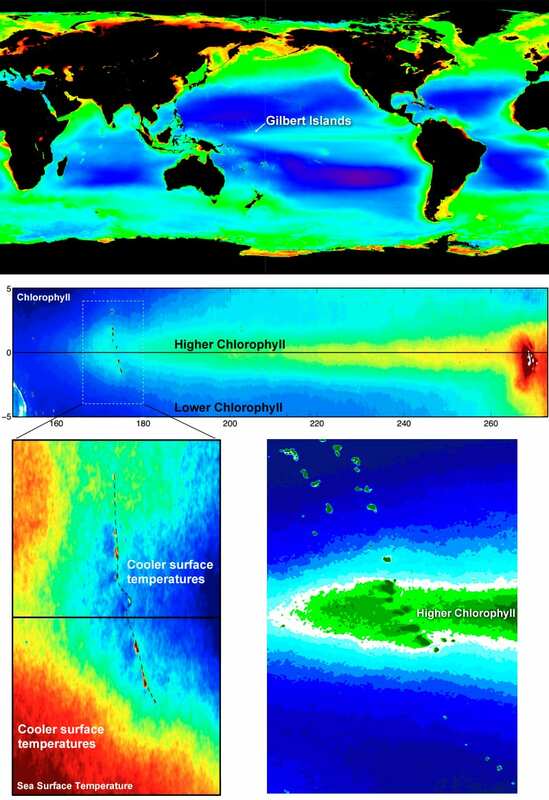 When he changed the view of chlorophyll maps on his computer screen to see the entire tropical Pacific at once, he saw that chlorophyll concentrations jumped up again exactly at the Gilbert Islands on the equator. Satellite maps also showed cooler sea surface temperatures on the west sides of these islands, part of the nation of Kiribati. So Karnauskas and Cohen began to investigate how the EUC, which runs between 2 degrees (138 miles) north and 2 degrees south of the equator, would affect the equatorial islands’ reef ecosystems, starting with global climate models that simulate impacts in a warming world. Global-scale climate models predict that ocean temperatures will rise nearly 3°C (5.4°F) in the central tropical Pacific in this century. Warmer waters often cause corals to bleach, a process in which they lose the tiny symbiotic algae that live in them and provide them with vital nutrition. 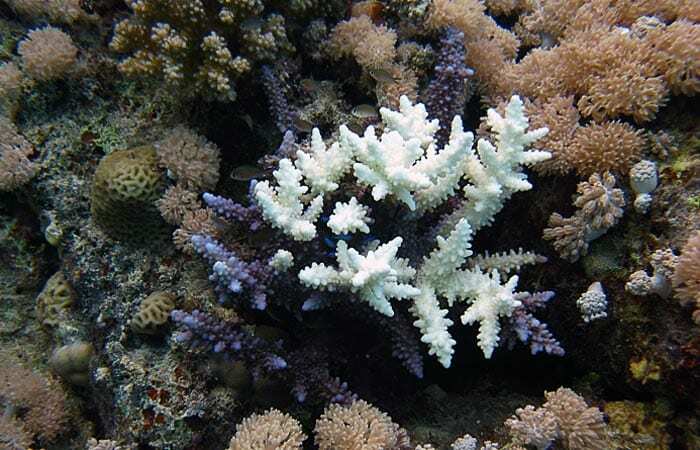 “Bleaching has been a major cause of coral mortality and loss of coral reef area during the last 30 years,” Cohen said. But even the best global models, with their planet-scale views and lower resolution, cannot predict conditions in areas the size of these small islands. “The models don’t even ‘see’ them,” Karnauskas said. 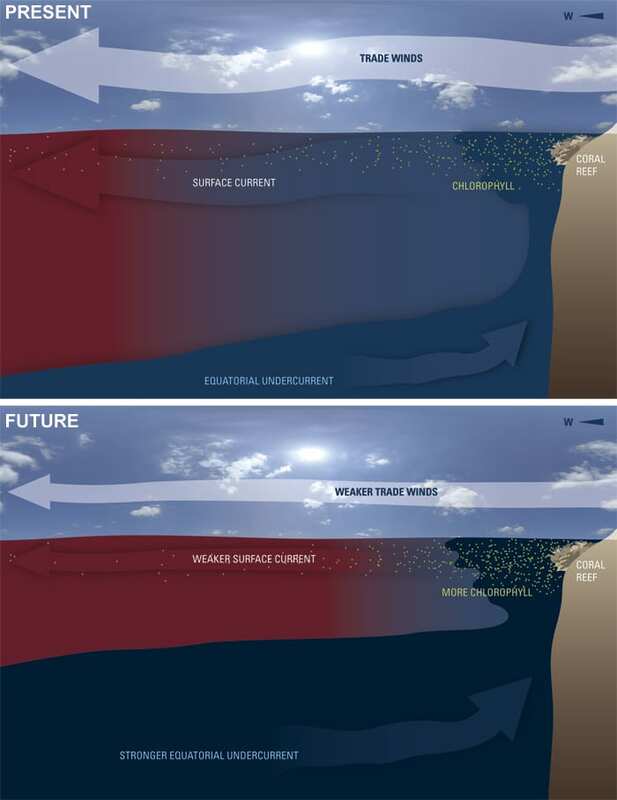 Their model predicts that as air temperatures rise and equatorial trade winds weaken, the Pacific surface current will also weaken by 15 percent by the end of the century. The then-weaker surface current will impose less friction and drag on the EUC, so this deeper current will strengthen by 14 percent. “Our model suggests that the amount of upwelling will actually increase by about 50 percent around these islands and reduce the rate of warming waters around them by about 0.7oC (1.25oF) per century,” Karnauskas said. The scientists hope to measure current temperature variations and sample corals around the perimeters of the Gilbert Islands. They also plan to study the degrees of connection between the islands, to learn if larvae of corals or fish could disperse across the distances from island to island. A handful of coral atolls on the equator, some as small as 4 square kilometers (1.54 square miles) in area, may not seem like much. 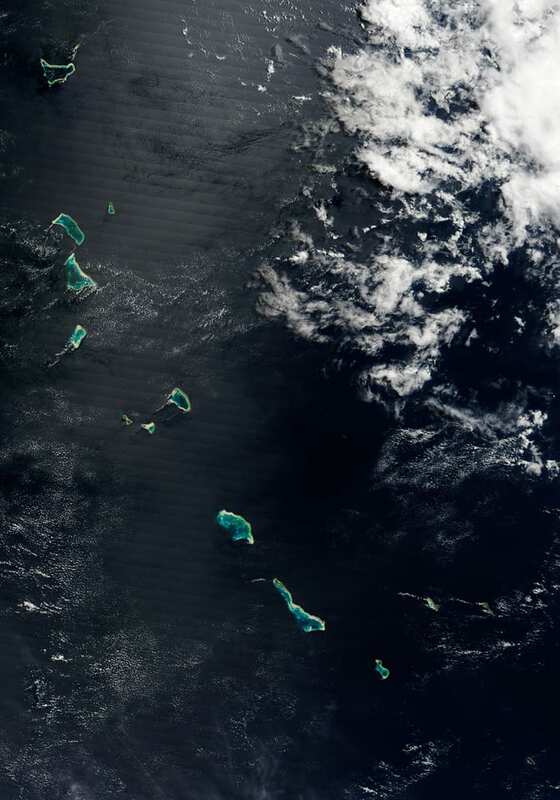 But Karnauskas’s and Cohen’s results indicate that waters on the western sides of the islands will warm more slowly than at islands that are not in the way of the EUC. That gives the Gilbert Islands a significant advantage over neighboring reef systems, they said. “While the mitigating effect of a strengthened Equatorial Undercurrent will not spare the corals the perhaps-inevitable warming expected for this region, the warming rate will be slower around these equatorial islands, which may allow corals and their symbiotic algae a better chance to adapt and survive,” Karnauskas said. If the model holds true, then even if neighboring reefs are hard hit, equatorial island coral reefs may well survive to produce larvae of corals and other reef species. Like a seed bank for the future, they might be a source of new corals and other species that could re-colonize damaged reefs. “The globe is warming, but there are things going on underfoot that will slow that warming for certain parts of certain coral reef islands,” said Cohen. “These little islands in the middle of the ocean can counteract global trends and have a big impact on their own future, which I think is a beautiful concept,” Karnauskas said. 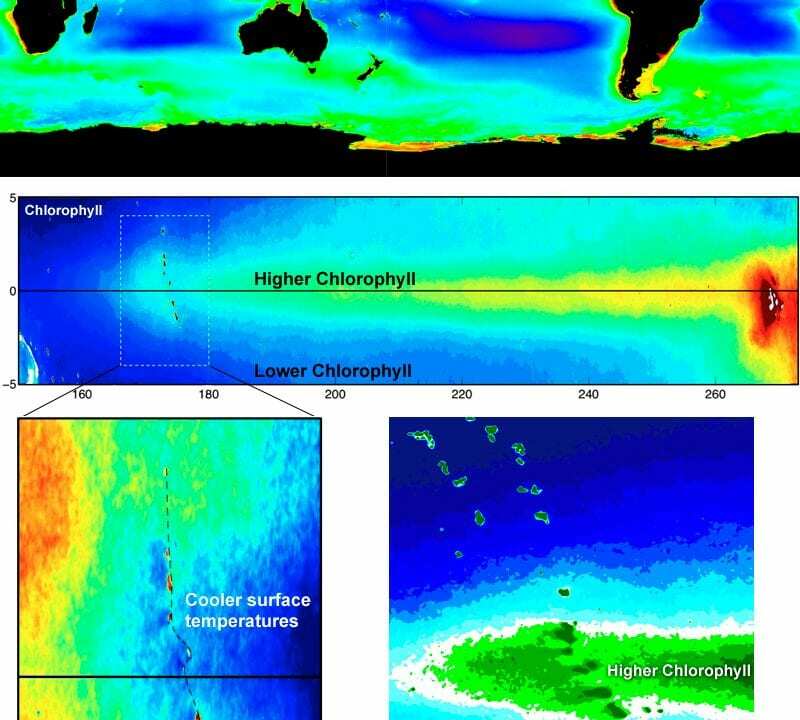 TOP: WHOI climate scientist Kristopher Karnauskas examined this global satellite map of chlorophyll in surface waters, indicating the growth of phytoplankton. Higher chlorophyll is shown in aqua, green, yellow, and red; lower in blue and purple. To the left of South America, a line of chlorophyll extends westward toward the left side of the map. MIDDLE: When Karnauskas moved the map to look at the whole Pacific basin and focus on the equator (black line), he saw higher chlorophyll values (top map) toward the west at the Gilbert Islands. At the right are the Galapagos Islands, west of South America, where the Equatorial Undercurrent (EUC) carries nutrients and cooler water toward the surface around the islands. As a result, the islands have higher chlorophyll levels (red) than surrounding areas. BOTTOM LEFT: The ECU also hits the Gilbert Islands, which have localized regions of higher chlorophyll. In a close-up map of sea surface temperatures (SST) near the Gilberts (part of the nation of Kiribati), dark blue on the islands’ west sides indicates cool water upwelling from the Equatorial Undercurrent. TOP (Present): At present at the equatorial Pacific Gilbert Islands, east-to-west trade winds produce a surface current along the equator. The Equatorial Undercurrent (EUC) flows in the opposite direction at 100 to 200 meters depth. When it hits a barrier (such as an island), the cooler, higher-nutrient water in the EUC flows up toward the surface. The waters near the island exhibit both cooler temperatures (shown as blue) and higher productivity of chlorophyll-containing marine phytoplankton, both of which diminish to the west.